Topline are long term installers of high quality structured cabling solutions, telecom cabling, related containment and equipment. Network infrastructure is a fundamental base essential to IT services. Poor quality and badly installed network infrastructure can have a significant impact on the performance and reliability of IT systems. Our installations are specified and planned by experienced technicians who have extensive knowledge of network design and installation to avoid problems that could be costly or disruptive to resolve. Installations are carried out using high quality materials from major respected brands to ensure years of trouble free service. Topline have installed and maintained network infrastructure at a wide range of sites, including small offices, call centres, right up to large sites consisting of multiple buildings and satellite data cabinets. 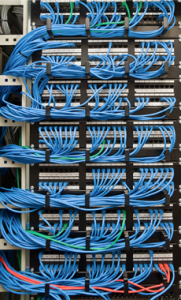 We also supply, install and maintain active network equipment, such as network switches and fibre transceivers. We have experience of taking over maintenance of data and telecom cabling installations initially supplied by others, and subsequently fault finding, upgrading and extending those installations as necessary. Topline also supply and maintain wireless networks and wireless building to building links.